Yesterday I tried to be thankful. I really did. But I couldn't make myself feel it at all. I wasn't thankful for the sunny morning or the afternoon deluge that left the streets flooded. I wasn't thankful for eating lunch with my teenage niece or dinner with my family. Nothing worked yesterday. So this morning, I tried again. 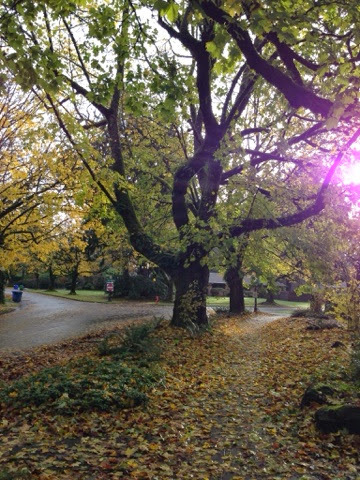 Here in Portland, it's a crisp Autumn morning - perfect for taking a walk under tall, yellow-leafed trees, sloshing through piles of wet leaves. Growing up, was my favorite season in the midwest. It is a something I have always missed since moving to California. Here in Portland, I get to experience that beauty again. Today I am thankful for those trees and for my two legs that could walk me under them.